Habit: Linum lewisii is a widespread low-growing perennial. It forms a mound of densely clustered stems 8-24 inches long. The foliage mound stays closer to the ground, while lovely sky-blue, radial flowers climb higher, up to 3 feet above the foliage. Each flower has 5 delicate petals which are not fused. Shortly after blooming in late spring, petals fall off, revealing 5 persistent green sepals. Leaves are opposite, linear to lance-shaped and grow 1-2 inches long, dressing the length of the stems. Ecology: its habitats include dry grasslands, open ponderosa pine forests, roadsides and rocky ridges at mid to fairly-high elevations. It is found in Alaska and all over Canada. In the U.S., it is more commonly found from the east side of the Cascades all the way through the Great Plains. Growing conditions: sun, and moist to rather dry, sandy or rocky soils. It is an excellent addition for rocky gardens, sunny garden paths, or even a container. Plants last only a few years but will self-sow once established. The species “lewisii” was named after western explorer, Captain Meriwether Lewis. 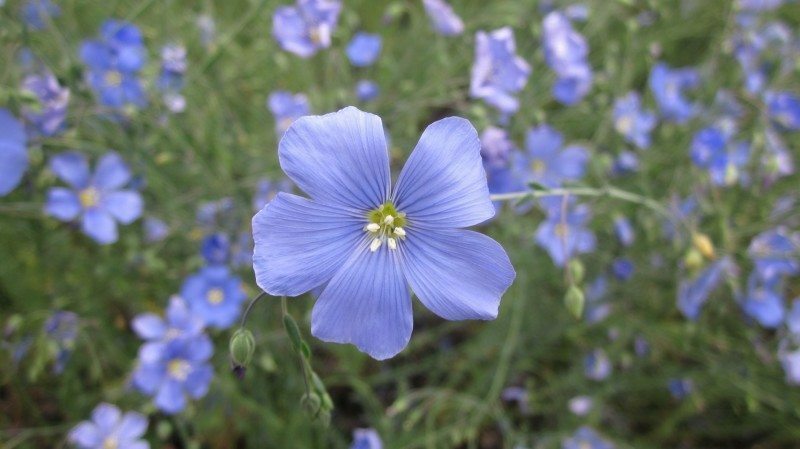 The genus name Linum means “thread, rope, linen or flax” and was originated from the Greek word “linon”. Peoples from Africa and Eurasia have cultivated plants of the genus Linum for about 4,000 years for the production of linen thread. Also, to this day, the species L. usitatissimum has been grown for production of flax seed. In north america, native people used Linum fibers to weave fabric, nets and baskets. Additionally, parts the plant were made into a solution to wash their hair and scalp.